fuel for thought: Where in the World is Westport WiNG? Where in the World is Westport WiNG? The buzz you’ve seen on twitter is true: we’re taking it to the open roads! From May 21-24 our team will be driving a Ford F-250 Super Duty bi-fuel pick-up featuring the Westport WiNG™ Power System from Detroit to New York, running entirely on compressed natural gas (CNG). Why, you ask? 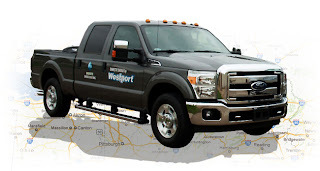 Our team needs to be in New York City for the Westport Innovations annual Investors’ Day on May 24; but instead of flying there, we see this as the perfect opportunity to showcase the WiNG-powered Ford F250, and meet our friends and fans along the way. We’ve planned stops along the route where you can come visit us, learn more about the bi-fuel truck, and even give it a test drive! Since Westport will start delivery of the trucks later this year, this will be the first opportunity for many people to see and drive the truck. This isn’t just about showing off the truck, though, it’s also about promoting the use of CNG as a vehicle fuel. By driving the entire route on CNG we hope to demonstrate how easy (with a bit of planning) and affordable it is to use as an alternative to gasoline. Throughout the 700 mile journey our road trip crew will be documenting their experience driving the super duty bi-fuel pick-up. The three Westporters who will be taking turns behind the wheel are Nicole Adams, Alissa Marczewski, neither of whom has ever driven the truck before, and John Howell. They’ll be recording the entire experience on video, giving our blog readers, Facebook fans and Twitter followers the chance to see first-hand what it’s like to drive a bi-fuel truck for the first time (so we expect to see some shaky video at the start!). Their video diaries will not only record their impressions and experiences along the way, they will also demonstrate the capabilities of the truck and how easy it is to fuel up with CNG. In addition to video, the team will be sharing photos and Tweeting throughout the trip. • Valley Ford Truck Sales, Cleveland OH – May 21 from noon to 3 p.m.
• SARTA-Clean Energy, Canton OH – May 21 from 4 to 5 p.m.
• Allegheny Ford Truck Sales, Pittsburgh PA – May 22 from 11 a.m. to 2 p.m.
• John Kennedy Ford, Pottstown PA – May 23 from 10 a.m. to 1 p.m.
• Times Square, New York City, NY – May 24 from 1 to 5 p.m. If you’re planning on visiting Nicole, Alissa and John at any of these stops, please RSVP to media@westport.com so they know who to expect (and so we can order enough barbecue, too!). Stay tuned as we share more about our road trip crew and updates from the road starting at 8 a.m. on May 21st!